‘My Best Friend, Bob‘ is another delightful little picture book. It is a story of friendship, separation and eventually, thankfully, reunion! It sounds like it has all the makings of a classic blockbuster, and it’s all about … guinea pigs! Brian and Bob are two guinea pigs who share a cage in a pet shop. They are great friends and love doing everything together – they love eating, sleeping and playing I-Spy! In fact, they have a pretty much perfect existence until one day everything changes! A little boy comes into the shop, spies Bob and decides that he is going to be his pet, and furthermore, he is going to call him FLUFFY! The two guinea pigs hardly have time to say goodbye to each other! So Bob is now gone and Brian is, very sadly left on his own. Life is just not the same now Bob has gone and there is no one for him to play with. The cage feels big and empty and every day Brian feels more miserable as he misses Bob more and more. So life goes on very glumly for Brian until one day, he also is chosen as a pet, this time by an old man. So Brian is taken away in a cardboard box, but as he doesn’t know where he is going he still feels sad! At this stage you feel things can’t get any worse, but don’t worry because there is a twist in the tail, and the story heads towards a happy ending. By a happy coincidence, Bob and Brian have been bought by the same family and at the end there is a very excited reunion and Bob and Brian do what they have always enjoyed – eating, sleeping and playing I-Spy. This is a very simple little story but one that young children can relate to. My daughter loves this story, because she is now at the stage where she has lots of ‘best friends’! In fact I think everybody is her best friend! But she is beginning to realise that you do special things with your friends and that they are very important to you. I also like the way this story goes full circle – Bob and Brian end up at the end of the book doing exactly what they were doing at the beginning! There is a certain security in that which children like. 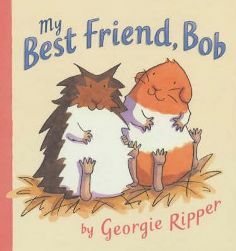 The first time I read this book with my daughter, she got very worried about both Bob and Brian! She was worried about where Bob was being taken and the fact that he was going to have his name changed! She was even more worried about Brian because he was feeling so sad, so much so, that she asked me whether we could go into the pet shop and buy him! After a few reads though, she just looks forward to the reunion at the end! This is a great book to get children thinking about friendship and how important it is to care for your friends. I think it also helps children to understand about separation, and I would certainly dig this book out if I knew that one of my daughters’ friends was going to be moving away, because I think it would help them to discuss how they were feeling. The illustrations in this book are very simple but also very expressive. There is quite a contrast between the guinea pigs’ faces when they are feeling happy, sad or worried, just by a few different strokes of the pen. So this is another entertaining story to read with little children, thankfully with a happy ending! No Comments on "My Best Friend, Bob"